Not only do the volunteers of the Wisconsin Humane Society do amazing work, helping homeless animals find loving families, and taking care of those who are not fortunate to find their furrever home.. It turns out they are also poets. In the naming convention kind of way. 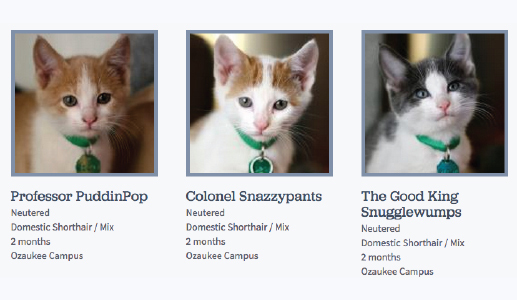 Check out these amazing (very) formal titles they have bestowed upon some adoptable kittens you can take home now. Or donate to the cause right here.